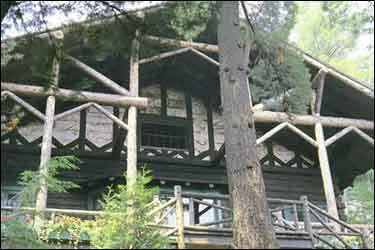 The Adirondack Great Camps built in the late 1800's and early 1900's were rustic but elegant homes owned by America's most well heeled individuals. No expense was too great though many of these "vacation cottages" were used only a few weeks each summer. 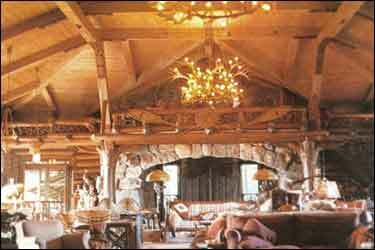 It was a place for the very wealthy and their friends to get away from the hectic pace of the cities. Many of these people lived quietly amongst the forest while loons made their mournful cries and wind whistled softly through the giant pines. Some entertained lavishly but in a soft gracious style. Since Dry Island is a private Adirondack luxury estate, you may do as you wish in any clothing you choose on your vacation. If you prefer that the staff leave for several hours or days, just say the word and you will have the entire island to yourself. Acknowledgements: Kaiser, Harvey H. - Great Camps of the Adirondacks, David R. Godine, Inc., Boston, 1982.